Trio Turnstile RS 518 are one of the most efficient and versatile models in the RS range of security turnstiles. An extremely durable access control turnstile, providing high traffic flow and reliability make it an ideal solution where a more utilitarian product is required. 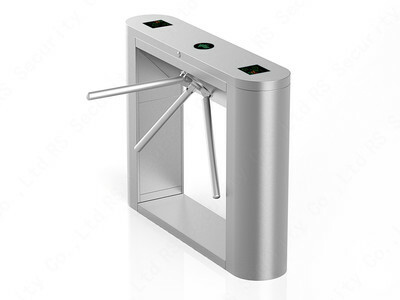 The rugged design and use of high quality materials ensures uninterrupted operation of the tripod security turnstile even in harsh conditions. Trio Turnstile RS 218S are still most probably the most common type of turnstile and the type that most people associate with because they are found in so many applications including: libraries, gyms, leisure facilities, shops, public buildings etc. The Trio Turnstile RS 218S operation can be controlled manually or automatically when connected to any type of access control system. We often supply proximity card or fob access control systems as a package with our turnstiles, so again, please get in contact with us if you would like a highly competitive quotation. The Trio Turnstile RS 218S is equipped with “antipanic” function (on the control panel) for free access in case of an emergency. The tripod turnstile has a neat design that can be supplied in a range of different finishes including; powder coated steel, brushed or polished stainless steel. Whatever you wish to achieve using turnstiles as part of your access control plans, please get in contact with us and one of our specialists will be able to advise you of the best options available to you.